* Crown molding and light rail accents in alder wood in a caviar finish. * Belvedere Granite Countertops in a unique leathered finish. *Flooring Tile by Porcelanosa in "Ferroker." *Muse Cadence Platinum iridescent backsplash tile by RBC tile and stone. 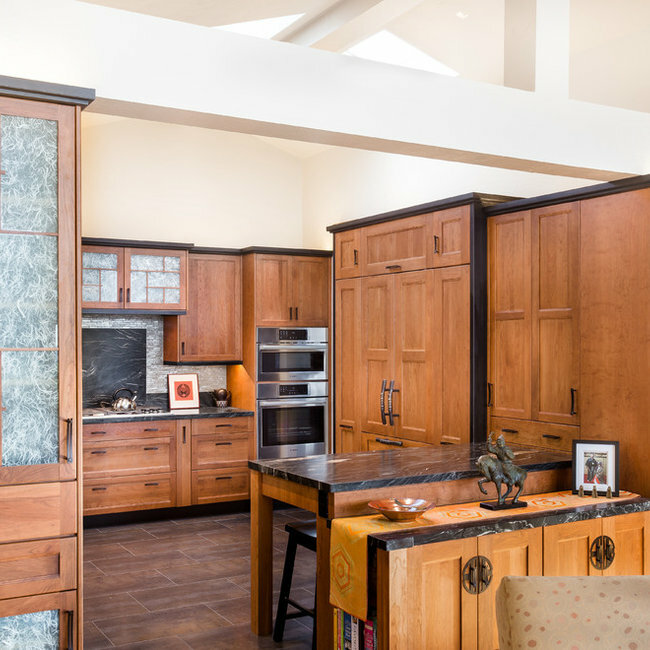 *Hardware includes Lariat appliance pulls and cabinet pulls by Rocky Mountain Hardware in their Zen Garden - Old America Collection. 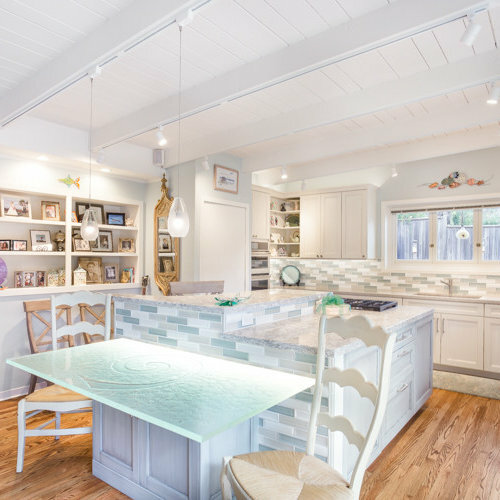 We hope you're as inspired by this kitchen as we have been! Our newly designed, luxurious,12 unit project in Walnut Creek, CA. All Bauformat of Germany cabinetry: frameless cabinet construction with a Manhattan door style and Stainless Steel handles in a Sand Beige High Gloss and White High Gloss finishes with matte colored interiors. The units feature top of the line Miele appliances, Cesarstone countertops, Hansgrohe, Grohe Concetto and Kohler chrome plumbing fixtures. 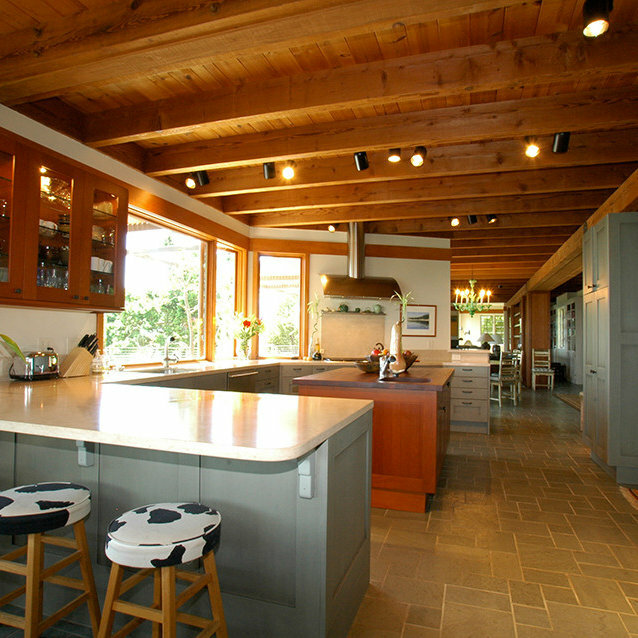 Installation of cabinetry by Kitchen Studio. 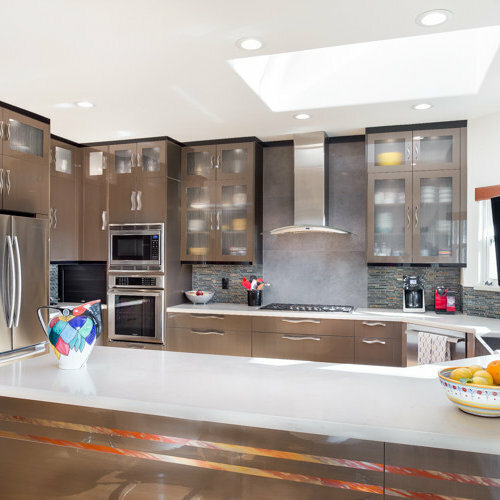 Cabinetry includes an Ultracraft Acrillux II door style in Linear Bronze II in high gloss finish, scratch resistant with Silver Metallic edgebanding, wipe and go interiors and soft close hinges. 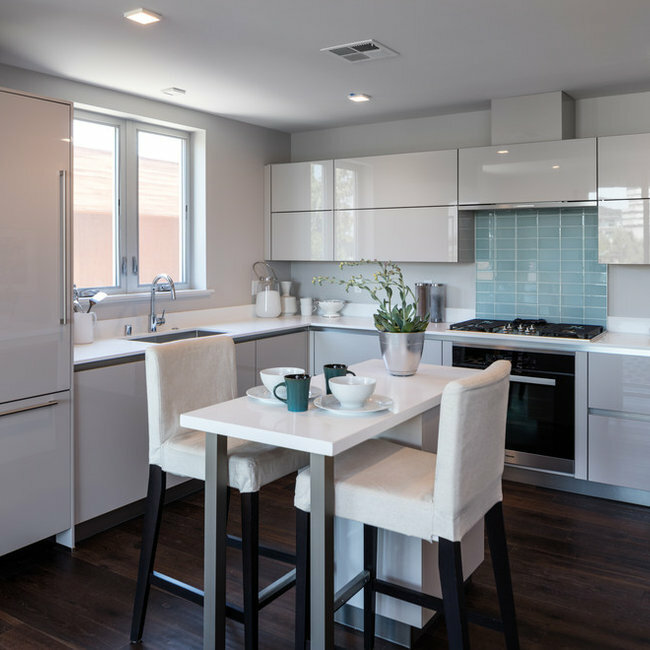 Finished interiors include: appliance garage, rollouts, pull out trash, utensil dividers, spice rack, tray dividers, touch dimmers and docking drawer accessory. 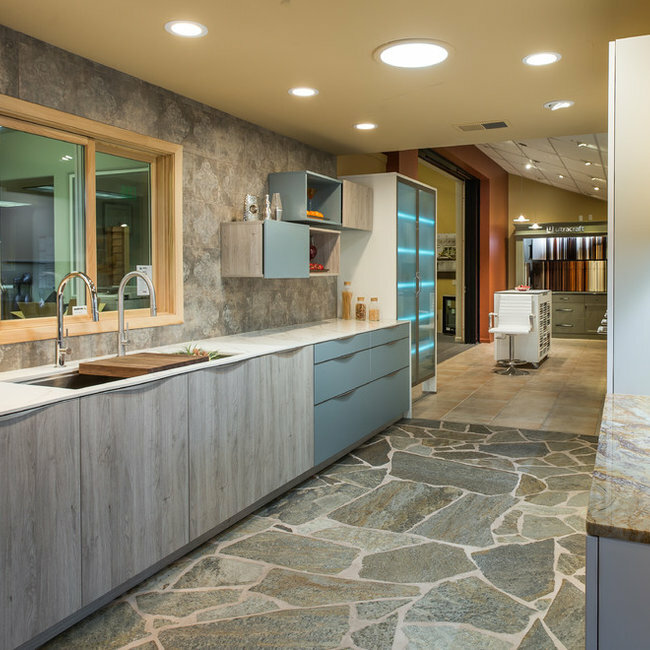 Features a Native Trails Farmhouse Stone Sink in Slate and Caesarstone Dreamy Marfil quartz countertops with glass mosaic backsplash and Lappato Graffite Wall tile by Bau Tile. All Satin Nickel hardware. 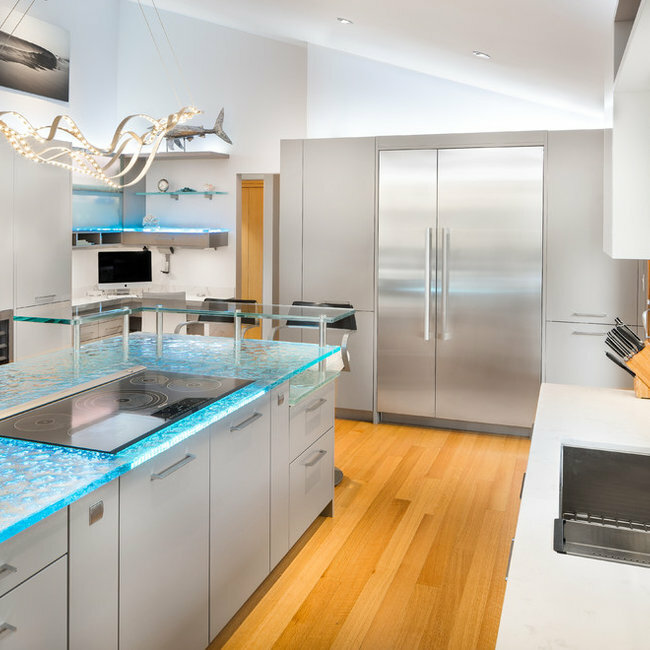 Cabinetry glass is Bendheim Glass in Italian Satin Gossamer, vertical, tempered glass. Tired older home in Carmel area, renovated to become a beautiful timeless home with warmth and comfort. 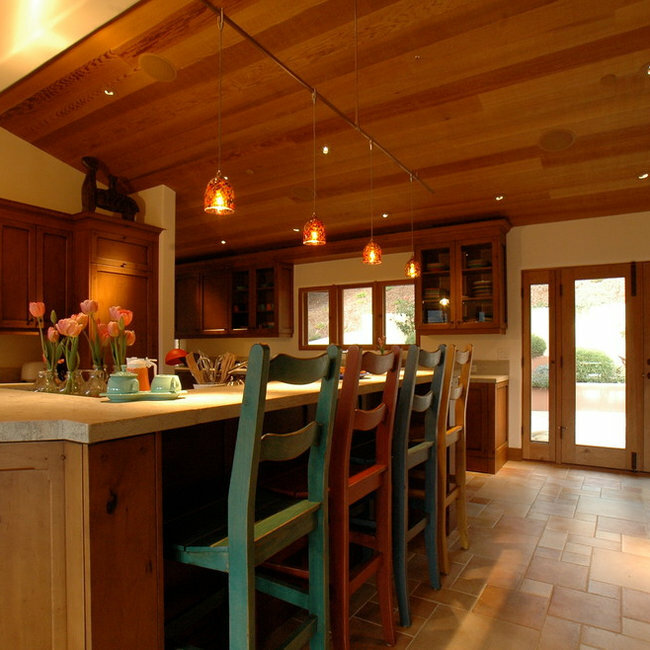 Sandblasted wood ceilings stained to perfection. 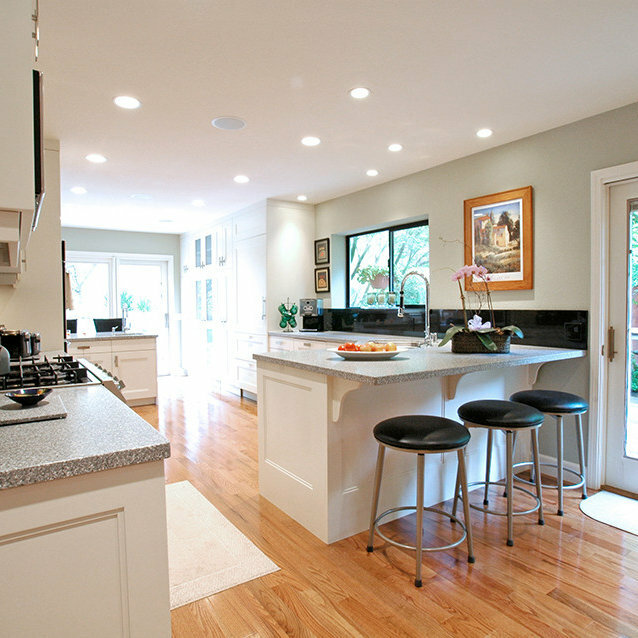 Warm wood floors throughout; Taj Mahal quartzite countertops and Kohler stainless apron front sink. Custom Cupboards cabinetry painted on craftwood. James Martin Furniture used in the bathrooms for a beautiful furniture look too! 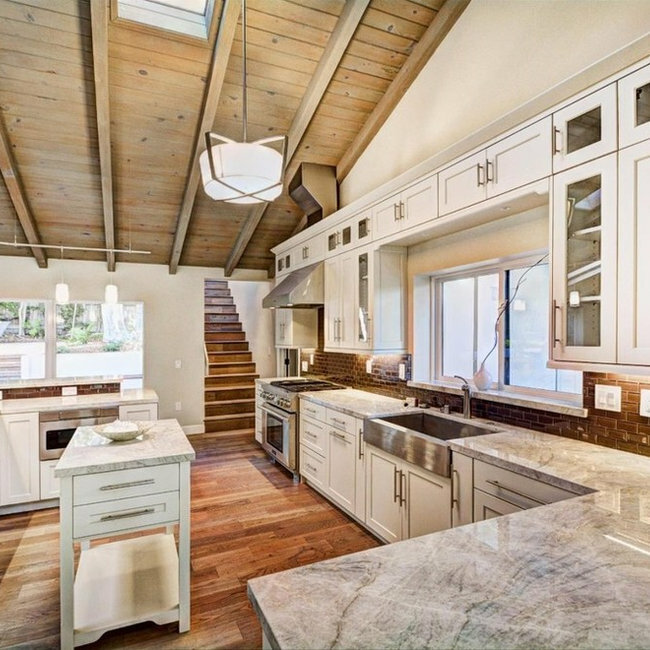 This home is nestled in Carmel Valley’s mountains used as a retreat for weekends and holidays from their main Palo Alto home. They worked with a wonderful architect on the Monterey Peninsula Paul Davis, Sr. to recreate the feeling of their experience at Bernardus Lodge within many areas of this remodel. We used very rustic alder wood for the kitchen cabinetry, with a custom created door style to meet the needs of the client’s simple, yet elegant taste - she wanted to feel comfortable in her space and be able to live there too...choosing materials that ‘lived’ with her such as limestone for the counters that were fired (roughened) and porcelain tiles throughout the home that give her the look of a Mexican Saltillo, but not the maintenance requirements. 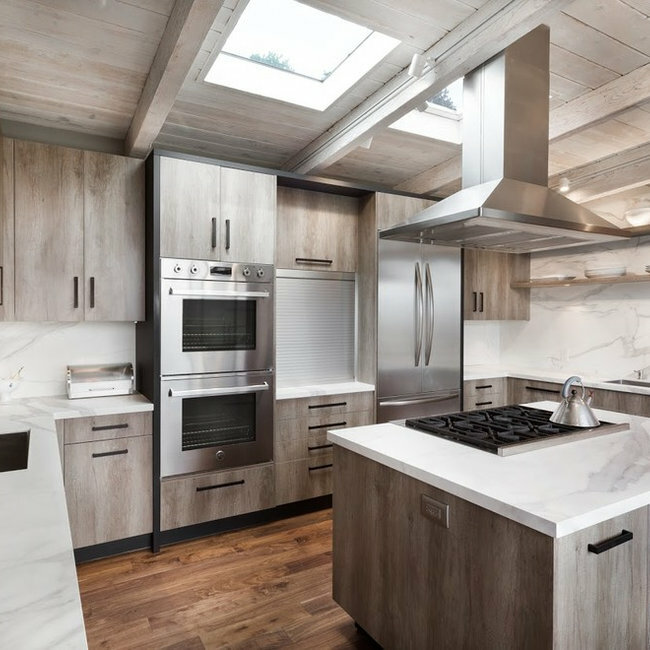 Dacor cook-top with downdraft; Dacor single ovens and microwave; Sub-Zero refrigeration (fully integrated); Miele fully-integrated dishwasher; Rohl faucet and stainless steel Undermount sink from Blanco. Acrilux horizontal grain silver thermofoil, high gloss door style. Espresso, polished chrome hardware.